Anyone who is considering hiring a private investigator in Michigan first needs to know that not all Michigan private investigators are equal. Advanced Surveillance Group understands Michigan laws and codes related to surveillance, corporate laws, background investigations, and custody cases. Since 1999, we have been providing Lansing residents with thorough and reliable information. Before hiring a Michigan private investigator, it’s important to make sure you select one that is licensed and insured. It also helps to select a company that is local and not national. Our investigators are familiar with Michigan from Lake Michigan to Lake Huron and from the Upper Peninsula to the Ohio border. We have performed surveillance in rural areas, as well urban areas. Let’s be honest. We all have secrets, or we may tell someone a little white lie. Maybe you told your best friend she looks great in her new dress, even though you didn’t think it was very flattering. Or, maybe you listed yourself as 29 instead of 34 on your Tinder profile. It’s the big lies, the ones that can seriously impact your life, that we can ferret out. Our Lansing private investigator will find the information that people try to hide. If you’re wondering if your spouse’s business trips are become a little too frequent, or if an increased interested in how they look has you worried, you may want to consider our domestic investigation services. Are you thinking about getting a nanny for your children? Maybe you need a new accountant to handle receivables for your business? Before you offer the job to just anyone, consider hiring your Lansing private investigator for information regarding education, criminal records, employment history, driving records, or financials. 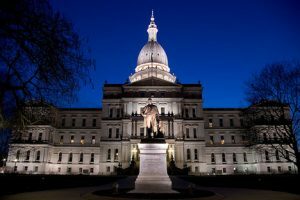 Lansing is the capital city of Michigan and features a diverse metropolitan area that is surrounded by rural farm land. The area is home to two medical schools, one veterinary school, two nursing schools, two law schools—including Western Michigan University Cooley Law School and Michigan State University College of Law, the Michigan State Capitol, the state Supreme Court, the Court of Appeals, a federal court, the Library of Michigan and Historical Center, and headquarters of four national insurance companies. Most of its 534,684 residents are avid supporters of the Spartans football team and other Big 10 sports.